It’s funny how India produces world-class economists but is an impoverished third-world country with an economy that languishes at the bottom of the barrel. Not ha-ha funny but ironically funny. Still, as Indians we can hold up our heads with pride that in our tribe we have economists such as Bhagwati, Srinivasan, Dasgupta, Bardhan, Basu — and of course Dixit. I recall with special fondness my sole meeting with Prof Avinash Dixit. It was in 1996. I was in my first year of my graduate studies in economics, almost totally ignorant of economics. One day, Brain Wright who was teaching us welfare economics said that we will not be having a class. Reason? Avinash Dixit was giving a lecture at the business school and we could not afford to miss that. I had no idea who Dixit was but we all went over to listen to the man. I often thank Brian for the opportunity. So off we went. The lecture hall was packed to the brim. Prof Dixit’s lecture went over my head. He was talking about agency theory. I did not have the vocabulary to fully understand what he was talking about but still I got quite a bit of it because he is a great teacher. It has to do with principals and agents, etc. What I found delightful was his heavy Marathi accent. Later I went up to him and introduced myself saying that I too was from Maharashtra. I have been recommending “Thinking Strategically” which Dixit co-authored for all who care to understand game theory and its applications for years now. Recently, the Finance&Development site of the International Monetary Fund carried a profile of Avinash Dixit. (Thanks to Rajan Parrikar for the link.) I loved reading it. It’s interesting that the article records that Dixit was drawn to game theory after reading Thomas Schellings The Strategy of Conflict. I was drawn to economics after reading that book. Later I read Micromotives and Macrobehavior by Schelling. You must read it. Anyway, Prof Dixit has a great mind. Check out the profile. Here are a few excerpt, for the record. Teaching game theory, he insists, must be fun—he has won awards for his teaching prowess—and he tries to illustrate key concepts with tales from films, books, and real life. Others praise his wit. “Avinash Dixit is one of my favorite economists, in part because he has a trait that is extremely rare among economists: a good sense of humor,” said Steven D. Levitt, coauthor of the best-selling book Freakonomics. He is also famous for his textbook on trade with Norwegian economist Victor Norman, The Theory of International Trade, which was enormously influential, and his work on oligopoly and industrial organization. What became known as the “Dixit-Stiglitz” model underpins a huge body of economic theory on international trade, economic growth, and economic geography—a model tapped by Paul Krugman, who won the Nobel Prize in 2008. The model, first published in 1977, became a building block for others in the new fields of endogenous growth theory and regional and urban economics—what journalist David Warsh described as “one of those economical and easy-to-use ‘Volkswagen’ models that were the hallmark of MIT” (Warsh, 2006). Monopolistic competition was pioneered by Joan Robinson and Edward Chamberlin in the 1930s and was the stuff of basic economics for years. But Stiglitz—who went on to win a Nobel Prize in 2001 for his work with Michael Spence and George Akerlof on the analysis of markets with asymmetric information—and Dixit took it to a new level. “The success of the Dixit-Stiglitz model of monopolistic competition might have come as a surprise to students of the history of economic thought, as it was by no means the first attempt to deal with imperfect markets or monopolistic competition,” said Steven Brakman and Ben Heijdra in a book analyzing what they termed a revolution in the analysis of imperfect competition. The theory of monopolistic competition shook up modern trade theory, which Oxford economist Peter Neary attributed to “one factor above all others”: the development of the “elegant and parsimonious” model by Dixit and Stiglitz. Dixit has spent the past decade watching what drives economic development, including governance and institutions, and has studied fragile states—poor countries recovering from conflict or disasters. “Governance was neglected by economists for a long time, perhaps because they expected the government to provide it efficiently. However, experience with less developed and reforming economies, and observations from economic history, have led economists to study non-governmental institutions of governance,” he says (Dixit, 2008). To this he brings his habitual skepticism. While Dixit acknowledges the importance of democracy, property rights, contract enforcement, and the provision of public infrastructure and services that support private economic activity, he is scathing about attempts to draw up a menu of items that underpin development in low-income countries. The World Bank’s Philip Keefer, who was Dixit’s respondent at the 2005 lecture, said the Princeton professor was right to be skeptical, but “big ideas” could help guide a country’s reform agenda. To work effectively, Dixit said, change must be coordinated and take place across several fronts. “The one recipe that works is what I call ‘strategic complementarities.’ That is, if 15 things need to be done, doing 3 of them is not going to get you 20 percent of the way there. It’s going to get you much less. You’ll need to get all 15, or at least 13 or 12, right before you start to see any big effect. So that’s one thing, strategic complementarities, and the second is luck. Next > Does your brain work differently? Chitrakutdesh, yes, indeed I did forget Raghuram Rajan. Thanks. Cynic that I am I couldnt resist saying this, though not to undermine any person honorable. Many bright noteworthy minds esp. mathematicians, poets, historians, physicists, linguists, sociologists and economic theorists were born in socialist economies or simply put where their societies and upbringing didnt permit them to engage in any other expensive indulgences of wealth creation, inventions, enterprise or free speech. The sad reality is such noteworthy people have been largely exceptions vis-a-vis the intellect and talent that free economies like America have produced. They far outnumber us and their contributions to their government, national ideology and wealth creation is much more significant. I am sure none of the likes of raul vinci, antonia maino and even the tiny mind in blue turban integrity would know who Avinash Dixit is and they wont ever care to know. Thanks for the post. 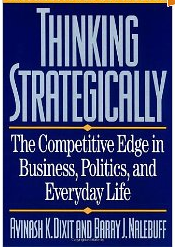 Delighted to see this post on Prof.Dixit as someone who used the great book “Thinking Strategically” as a part of my Game Theory Course curriculum. I am grateful to my economics prof for introducing me to Dixit and Nalebuff books. A baby elephant restrained by a rope does not attempt to break the rope when it grows much bigger and much stronger: the shackles are mental. Then, one day, it accidentally breaks the rope. Now it has to escape the confines of its’ master. Having done that, it must leave the urban areas and return to the wilderness. When it gets past the city and reaches the wilderness, its’ own brethren treat it like a stranger. When it ultimately adapts to the wilderness, it is one in a multitude, but is happy to belong and be with its’ own with a new set of rules. (1)In life there is no perfect solution; only intelligent choices. (2)Conventional Western democracy is governance at the Lowest Common Level. (3) Things get worse before they get better. (4) Real change occurs when you have very little choice and are forced to make a decision. (5)There is dharma at every level, by the One says give up those dharmas and seek shelter (in Me only) without worry. It is still not clear what you mean by “failed attempt from my part to clarify Amartya Sen’s ideas”? Where did you get the idea that Raghuram Rajan wrote an email to me, and I posted a part of this email to this blog? It appears you wrote to Raghuram Rajan implying that I quoted from an email from him on my blog. Why did you do that? That is a total misrepresentation of facts and a retraction is appropriate. I thought Prof.Dixit’s Lawlessness book full of insights for India. Of course, as a Prof. he is constrained when writing a text-book for a universal readership- still, it would be good if there was some sort of discussion thread or something for Indian readers including those who are interested in the old Niti shastras. Jain religion and Indian math also spent a lot of time on Combinatorics – presumably this was for Probability and Decision theory. Anyway, it would be interesting to see a blog or a discussion thread or something like that people reading Dixit or Basu or whoever can subscribe to and post on- especially if topical issues also receive mention. So Amartya Sen is an impostor, huh? I really appreciate Rajan Parrikar’s contributions to Indian Classical Music, but one has to be quite oblivious to recent progress in human development to think that Amartya Sen is not the “real deal”. Sen’s capabilities approach is theory at its best – informed by the practice of development economics, rooted in geography, and enabling the reform on real-world practice in human development. I do not mean to write off economists in the traditional mould, but I do think that there is some justification to the criticism that economists are not rooted in place, and by extension not rooted in reality. I am quite in awe of the accomplishments of the Princeton economists, but the leading research on the spatial economics of the New York Metropolitan Region is not going on in Princeton, nor in the Rutgers Economics Department, but in the Rutgers Policy and Planning School. The names James Hughes and Joe Seneca might not be very popular among traditional economists, but if you wanted an estimate of the economic development impacts of a new tunnel under the Hudson river, I don’t think anyone at Princeton will be able to do the job. Amartya Sen is not the “real deal”. Again are his theories on development not common sense? He thinks that he is an authority on not just economics, but on all things cultural and all things pertaining to India. How come these people so concerned about India do not stay in India and try to do good by staying in their own country? He is quite a hack in the “Argumentative Indian”; Indians do not even realize it, because in their race to become engineers and economists, they have no clue as to the foundations or history of their own culture, so when people write rubbish about Indian culture and history as most leftists do, they get scared by the numerious footnotes, and claims to scholarship, and what not, and are unable to offer a good response to such deracinted shallow leftist thinking…I doubt that even economists hold him in high regard, considering him something like ‘the Mother Teresa” economist…. Your comments remind me of Noam Chomsky’s famous sentence “Colorless green ideas sleep furiously”. Now for those who are really serious about learning about Indian history, here is a good set of eyewitness accounts in eight volumes. Read for yourself and judge for yourself, no need to read people like Thapar…I suggest every serious have a copy of this in their home. A nation that does not understand its history produces the kind of spectacle you see in India today.